· There's no denying this speaker's natural precision, clarity and efficiency. · Enclosure type Infinite baffle, front flush with wall. · Speakers' pivoting horn allows listeners to point the sound where they want it to go. Klipsch R-5502-W II In-Wall Speaker (Sold as Each) Brand New with Free Shipping! P" titanium tweeter. Wide Dispersion Surround Tech. paintable magnetic grille. IR receiver knock-out for remote repeater. 8-ohm impedance. Trending at $557.50eBay determines this price through a machine learned model of the product's sale prices within the last 90 days. The titanium high frequency drivers of the 4000 Series are effective to 22kHz. Titanium allows for an exceptionally rigid, lightweight diaphragm, resulting in very high speed, instantaneous transient response. The addition of a Linear Travel Suspension to the tweeter increases high frequency detail and smoothness. Pivoting Tractrix® Horn tweeter for clear sound in any location. Pivoting TractrixÂ® Horn tweeter for clear sound in any location. The addition of a Linear Travel Suspension to the tweeter increases high frequency detail and smoothness. Two vertically stacked Tractrix Horn-loaded tweeters maximize surround sound effects. Dual 1 (2.54cm) Titanium diaphragm compression driver mated to pivoting 90 x 90 square Tractrix Horn. Item model number: R-5650-S II. 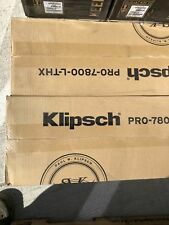 Klipsch R-3800-W II In-Wall Speaker (Each) Brand New with Free Shipping! 1" tweeter mated 90-degree by 60-degree pivoting Horn. Pivoting Horn compression driver tweeter. 8" IMG woofer. 5 out of 5 stars - Klipsch R-3800-W II In-Wall Speaker (Each) Brand New with Free Shipping! 1 product rating1 product ratings - Klipsch R-3800-W II In-Wall Speaker (Each) Brand New with Free Shipping! Klipsch 6.5" White In-Wall Speaker, Model R5650S II (Sold As Each) Brand New! Two vertical horn tweeters. low-profile SlimTrim™ magnetic grille. IR receiver knock out. Klipsch R-1650-W In-wall Speaker Brand new. Condition is New. Shipped with USPS Priority Mail. These speakers are in good condition and work well. Great addition to have in your collection. These speakers are in good condition and work well. Great addition to have in your collection. Local pickup. THX® Select 2 Certified. 1" Titanium Diaphragm Compression Driver mated to a 90° x 90° square Tractrix® Horn. Four 5.25" Fiberglass Cone Woofers. RMS Power 35W. Speaker Type Main / Stereo Speakers. Width 9.3in. Height 14.3in. Impedance 8ohm. Sensitivity 88dB. Peak Power Handling 140W. Color White. Klipsch R-5650-S Speaker Replacement Crossover Circuit And In Wall Frame. klipsch CRossover circuit removed from an in wall speaker system. The crossover circuit is embedded in the frame so The frame is included also Model R-5650-S These are from a smoke free Home. 1" titanium tweeter with pivoting Tractrix® horn. Product Highlights paintable SlimTrim™ magnetic grille. IR receiver knock-out for remote repeater systems. treble and mid-bass attenuation switches. THIS IS A SINGLE SPEAKER, IN A CASE FOR HANGING ON THE WALL. THE SPEAKER HAS BEEN TESTED AND WORKS PERFECTLY. IT SOUNDS GREAT. IT SHOWS JUST A LITTLE VERY MINOR SCRATCHES HERE AND THERE, BUT NOTHING AT ALL SERIOUS. THX® Select 2 Certified. 1" Titanium Diaphragm Compression Driver mated to 90° x 90° square Tractrix® Horn. Power Specifications Note: The manufacturer has specified the maximum power handling of this speaker as 150 watts RMS (600 W Peak). The horn design dramatically increases efficiency by enabling the speaker to produce more output using less energy. Trending at $104.95eBay determines this price through a machine learned model of the product's sale prices within the last 90 days. 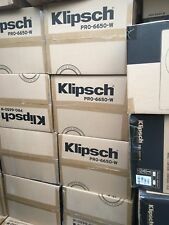 Klipsch PRO-6800-W 160-watt 8" In-Wall Speakers AUTHORIZED-DEALER $1000pr List ! Covering the whole of the speaker makes painting the product both simpler and quicker. Premium Neodynium magnets make it easy to install and remove and ensure a secure and flush fit without any moving parts. MISSING FRONT SCREEN ONLY. IN SLIGHTLY DISTRESS ORIGINAL BOX. These fees are non-negotiable. 6-1/2" woofer. sensitivity 92 dB. Horn array with dual 1" titanium tweeters. -One In-wall speaker. WHAT IS IN THE BOX frequency response 60-23,000 Hz (±3dB). power handling: up to 50 watts RMS (200 watts peak). You will receive: Klipsch R-2650-W-II White In-Wall Speaker. Klipsch R-5502-W II In-Wall Speaker. Klipsch R-5502-W II In-wall speaker. This is a brand new unit. I have 3 available. Box was opened, but it was not taken out of the box or used. You will receive: Klipsch R-5650-S-II White In-Wall Speaker. You will receive: Klipsch R-2502-W-II White In-Wall Speaker. You will receive: Klipsch R-3650-W-II White In-Wall Speaker.